According to a report released today by GlobalData, 42% of UK vegans converted to veganism in 2018, with most vegetarians (four fifths) having been vegetarian for far longer. It cites a wider variety of vegan options and better prices amongst reasons for the surge in conversions to veganism in the last twelve months. The recent survey reveals that 51% of UK vegans were motivated by ethical reasons, with slightly smaller group being motivated by health reasons, at 47%. 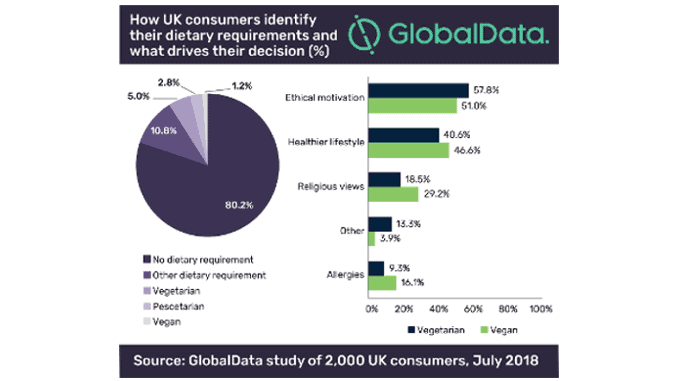 GlobalData’s study found that most consumers say that their supermarkets are meeting their needs, 90% of vegetarians said that they find everything they need in a supermarket in comparison to 79% of vegans. Another factor in the uprise was said to be the location of meat alternatives, which are now often found placed in supermarkets alongside the meat products. “How grocers manage product placement instore is also important; the founder of Beyond Meat, Ethan Brown, stipulates that their products must be located in the meat aisles, alongside other points in stores, as too many potential shoppers – many of whom may be meat eaters – are otherwise lost.